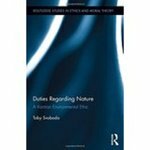 Svoboda, Toby, "Duties regarding nature : a Kantian environmental ethic" (2015). Philosophy Faculty Book Gallery. 37.